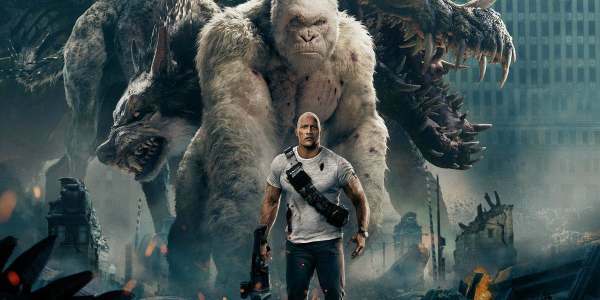 Warner Bros.'s "Rampage" movie starring Dwayne "The Rock" Johnson and a trio of giant monsters opened at the number one spot. It made about $34.5 million for a domestically and $149 million worldwide thanks to a strong $114,100,000 internationally. It currently holds an amazing 50% on Rotten Tomatoes. While that would be lame for any other movie it's the highest critical rating a movie based on a video game property has ever earned. While many have bee successful at the box office every single International live-action video game film is rated "rotten". Right now the "Rampage" movie is one point behind the new "Tomb Raider" reboot (49%). After that, you get "Prince of Persia: The Sands of Time" (36%) before dropping to "Resident Evil: The Final Chapter" (2017) (35%) and "Mortal Kombat" (1995) (34%). So it's the best of the worst right now. But it proves that The Rock is still a big box office draw. Paramount Pictures' "A Quiet Place", about a family hiding from monsters that track sound, dropped only one position to the number two spot. It lost about 35% over last week's take to make $32.6 million for a domestic box office gross of $100 million. and a worldwide total of $151 million. It's extremely impressive considering the film's budget was a "measly" $17 million. 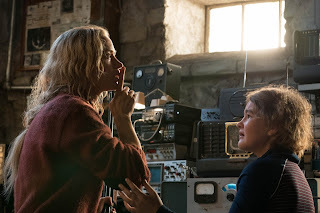 Even in its second week, John Krasinski's horror film only lost the number one spot by a hair. Warner Bros.'s "Ready Player One" dropped two positions to the number four spot. It lost a little more than half its take from last week (55.%) to make $11.2 million for a domestic box office gross of $115 million and a worldwide total of $475 million. Walt Disney's "Black Panther" moved two positions to the number six spot. It lost only 39% to make $5.3 million for a domestic box office gross of $674 million and a worldwide total of $1.31 billion. If it's still in the top ten when "Avengers: Infinity War" comes out in two weeks it would be the first time two MCU movies are in the top ten at the same time. Universal's "Pacific Rim: Uprising" dropped out of the top ten to the number 14 spot. It made $1.4 million for a domestic box office gross of $58 million and a worldwide total of $281 million. What do you think of this weekend's box office take? Did Jack Kirby Create Black Panther?